After a great run down Strait of Juan de Fuca, most of the fleet rounded Cape Flattery before the sun set and got to see a sight that most people never get to. Cape Flattery is the very northwest corner of the lower 48 states and a major landmark. But it is very remote by land and very few sailors venture out into the open Pacific. After rounding Cape Flattery, the fleet has starting the sailing down the rhumb line That means sailing the direct course to Hawaii for all those thinking of Mt. Gay mai-tais. Roll Call happens at 1200 Hawaiian Time or 3:00 pm Pacific Daylight and today the fleet is relatively close together about 160 miles offshore of Ocean Park, Washington on Willapa Bay. The weather pattern is setting up for boats to ride a path between the Pacific High hovering to the northwest of its usual location, and a low pressure zone along the Washington Coast that caused the cool weather and rain before the Start. If this weather pattern holds, it may result in a short, sweet ride to Hawaii. But the only thing constant about weather is change and the sailors will need to put the beautiful sight of Cape Flattery behind them and focus on figuring out what their weather crystal ball is telling them. The match race between the two performance boats in Racing 1 is a tight one with Firefly and Joy Ride taking turns with the lead. At Roll Call it was Firefly using its water line advantage to eek out a 10 mile lead. But leads are fleeting and it remains to be determined which has the right weather track. Racing 2 is also close as the boats are evenly matched, even if there is disparity between their types. Salient is sailing right on the rhumb line and has a course slightly east of the competition with a 5 mile lead on Anjo and Oxomoxo. But Kraken and Turnagain are only another few miles back. Anything can happen with this group. A little further back are the Cruising Class boats with Serenite has moved to a significant lead over the all female crew on Geminis Dream. The next step for all boats is finding the sweet spot to stay in the wind that exists between the two weather systems – all the while knowing that sailing directly to Hawaii is rarely the path to first place. Turnagain’s tracker stopped providing position updates early Monday morning. In a modern news cycle that likes to focus on bad things, some people lept to conclusions that something had happened to Travis McGregor and crew. But it was a simple matter of the tracker struggling with fixing upon GPS satellites to get a position. With some simple fixes aboard and by YB Tracking, Turnagain’s position had leap forward on the map by mid-morning. So don't panic if a boat's position does not update for a few cycles, and know that Race Committee is keeping a close eye. You can look at the Leaderboard positions using VMG from Start or VMG Recent. This number is a calculation of how fast a boat is sailing directly to the finish. If pointed right at Maui, then VMG is the same as boat speed. If not pointing at Maui, you have to use your high school trigonometry. Luckily YB does it for you. 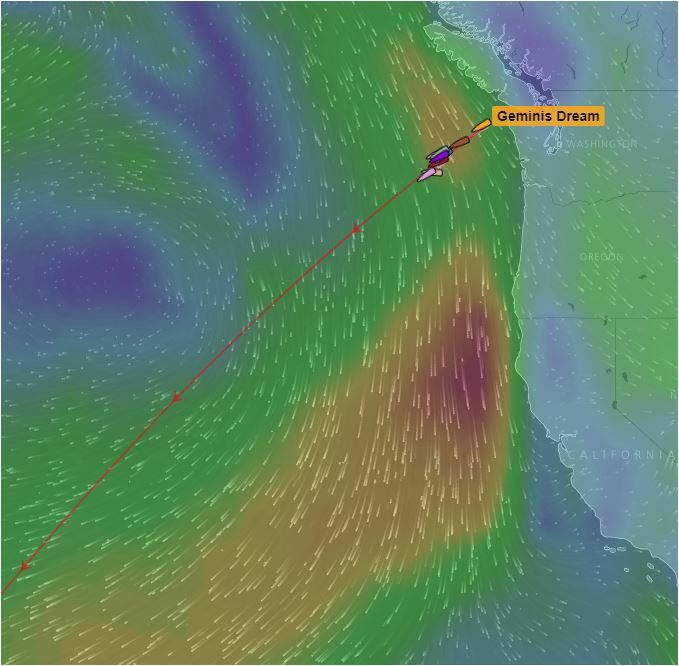 VMG Recent is how fast the boat is going to Maui averaged over the last 2 hours.